Looking through the entries in this contest, I've noticed that some people are having a difficult time achieving the general look of TF2 textures when it comes to the texturing stage for their entries. 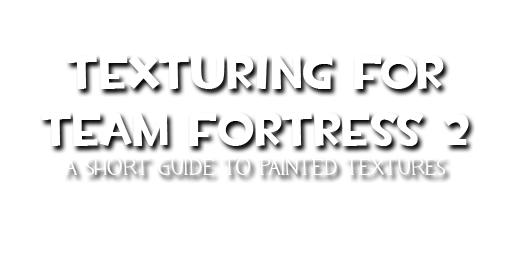 Considering that TF2 has a very specific visual style and a number of key elements that go into the visuals, I thought I'd put together a little guide to help people if they're struggling to get their textures looking like something that belongs in the game. To get an idea of what goes into making an object look like it fits into TF2, let's take a look at some elements that all objects in the game share from a texturing standpoint. Each object in the game has one or more base colors in its texture. These base colors serve as a starting point to differentiate materials from one another. For example, the scout's scatter gun has two basic colors; gray and brown. These colors serve to show the player that one part of the gun is wood and one part is metal. Everybody understands that wood is brown and metal is usually gray, so that's where our understanding of what the scatter gun is made of comes from. Base colors on objects are the solid colors applied to the objects in the game before any real texturing takes place. 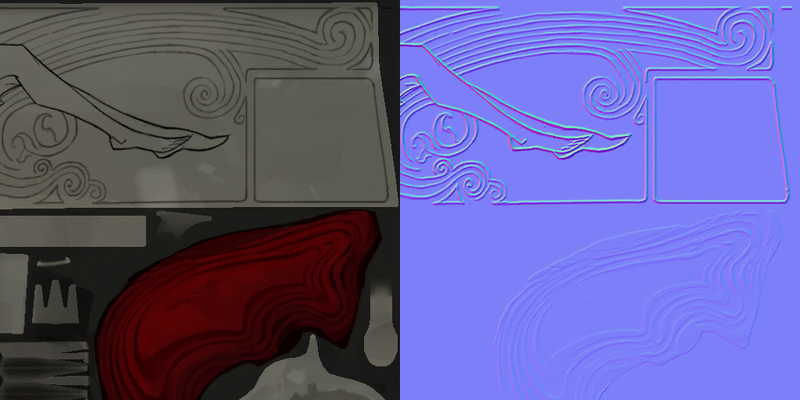 Once the base colors are taken care of, the texturing process can begin in earnest. The textures in TF2 are painted with large, sweeping brush strokes to give the impression of detail without deliberately spelling it out. These strokes are applied over the base colors to give texture and interest while still retaining the general original hue. The brush strokes are accomplished by using large, squarish brushes at high opacity. This results in large blocks of solid color which reinforce the original base colors. These large brush strokes are used not just to add blocks of slightly altered colors for interest, but also for painting wear and tear into textures. Wear, such as scratches on metal, is hinted at with blocks of solid color instead of the usual method of tiny scratchy marks you might see in more realistic texturing. 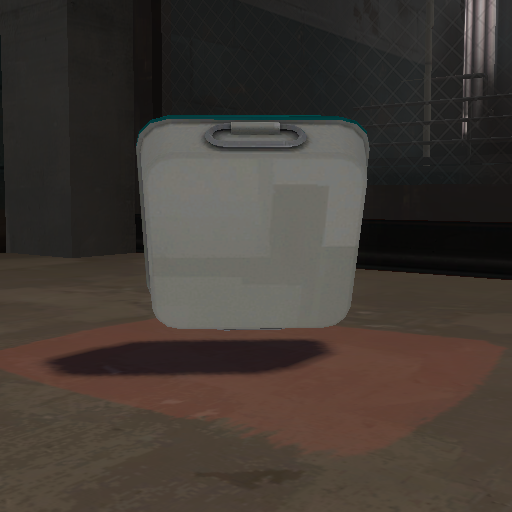 Most, if not all, objects in TF2 have ambient occlusion or some form of soft lighting baked into the textures. 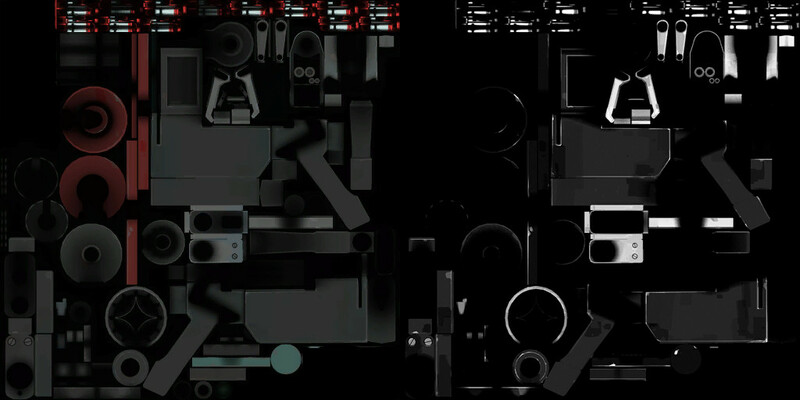 This serves to ground the modeled details on the objects by simulating ambient light. This is the same as any other game with baked ambient occlusion. However, ambient occlusion in TF2 also serves to add another layer of texture and grain to the hand-painted texture maps. Since this is a competition to create weapons and other related objects for the game, it's very important to understand how metal is represented. Do you notice anything unusual about it? If it seems like few of those colors are actually straight gray, you're correct. They all have some tint to them, warm or cool. 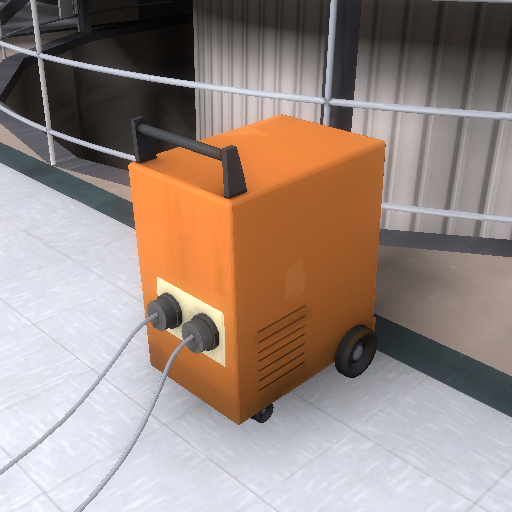 The people who paint the textures at Valve understand that gray is a boring color, so what they do is make it seem more interesting by giving metal a tint of some sort. All those weapons in the game you thought were gray are actually brown or purple or maroon! Each weapon in the game has a number of base color variations in the metal areas. There are lighter and darker areas to help break up what could be a very monotone object. These lighter and darker areas tend to alternate with one another so that the colors can contrast with each other. A screw head might be lighter or darker than the metal surface around it, for example. 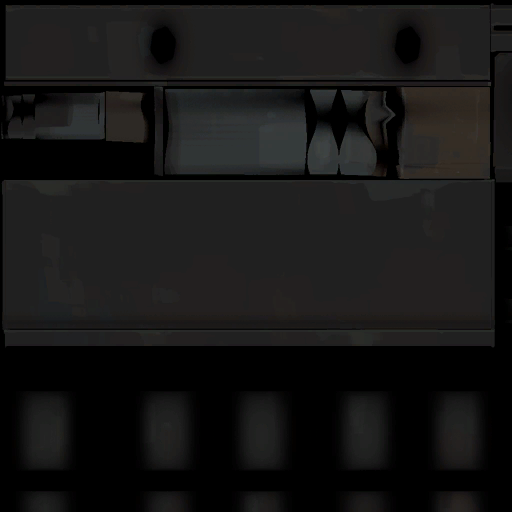 These light and dark variations might be obvious, such as in the palette used for the syringe gun, or subtle as in the palette used for the medigun. To emphasize the form of the guns and show that they're not brand new, Valve paints highlights onto sharp edges on their metal objects and also puts some wear and tear on the metal. While most of the edge highlights are just thin lines along edges, wear and tear is often shown with large patches of color painted with those same high-opacity brushes mentioned earlier. Most metal textures you see on models in TF2 will be accompanied by a specular map. These spec maps are generally based on the diffuse texture with ambient occlusion included. Including ambient occlusion in the specular map helps to emphasize the shininess of the edges by making anything in crevices dull. Because not all weapons are made of metal, it's useful to understand how wood is represented in TF2. 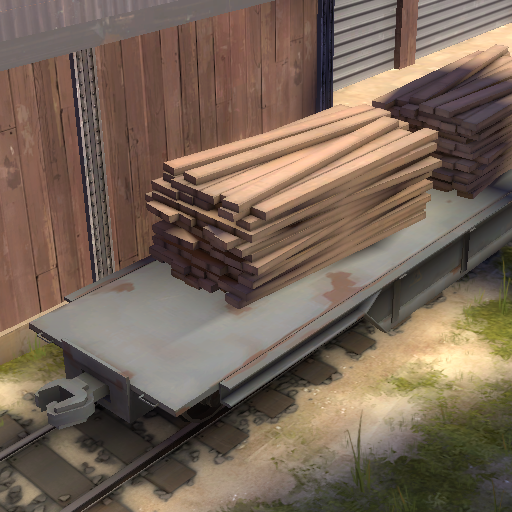 Wood in TF2 (at least on model textures) generally does not show as much color variation as metal. Despite the fact that wood has a grain, this is not always obvious when looking at wood on TF2 weapons' textures. Most wood is some shade of solid brown or tan, possibly with a few strokes to imply a wood texture. Subtle gradients are often used on wood to give the impression that it's worn and aged. As with many things, there exceptions to the above. 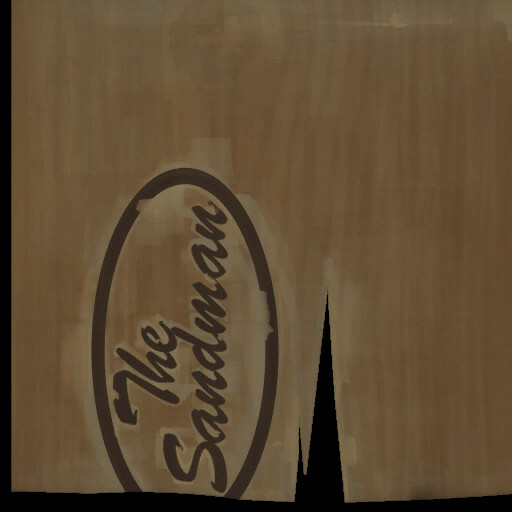 Two weapons, the Sandman and the Ambassador, both have prominent wood grain. Note that the examples above, as I mentioned before, are exceptions to the rule. Most wood on weapons in TF2 shows very little grain and is in general a solid color with brush strokes. TF2 does not use normal maps in general. In the cases where it does, the normal map is used sparingly and only to enhance certain details. 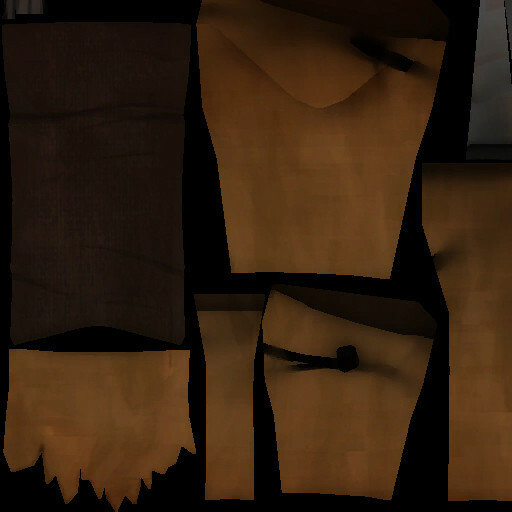 The folds of cloth on the characters' clothes are the only places on character models where you will find normal maps. The rest of the shading on characters is controlled with smoothing groups. Similarly to the characters, normal maps are used sparingly on weapons and most shading is achieved with use of smoothing groups and modeled detail. Before you create a normal map for your weapon, make sure the details you're trying to put into the normal map can't be modeled into a low-poly weapon without going over the triangle budget. One example of detail that could not be reasonably modeled into a weapon is the engraving on the Ambassador. Note that on the Ambassador's normal map, the only part which is not the neutral blue is the engraving on the barrel and the texture of the stained wood handle. These are details that would be reasonable to put into a normal map since modeling them would increase the triangle count to absurd levels. Always make sure that when creating textures for TF2, you are absolutely certain that a normal map is necessary if you plan on using it. When creating models and textures for TF2, it's important to remember that you're making something in somebody else's style. 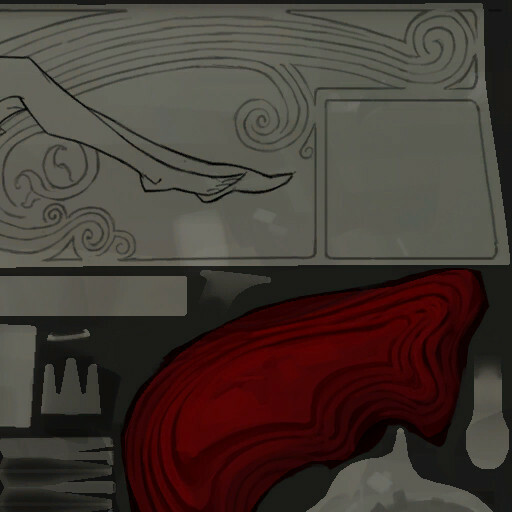 Valve has a large amount of material devoted specifically to defining their art style, so you should research the style you're trying to replicate and try to understand how it works, why it works, and how you can make your textures work in the same way they do. I hope this guide has been helpful. Good luck! Very useful. When I first put my weapon in I knew something didn't feel right and I soon realised after playing for a few hours that it was my normal map. You're right, rarely use it. 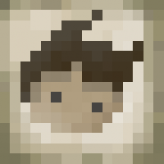 Also the texture style is great because it makes things easier and allows new artists to enter. 3D Art Director working on "A Hat in Time" by Gears for Breakfast. "When in doubt, ask the Polycount." Here's the Contribute! tips page for some information from Valve itself, while we're on the subject. I vote that this should be stickied. Also, Swizzle is undeniably CREDIT TO TEAM! Couldn't have come at a better time. Much appreciated! Who's the man? Swizzles the man! Way to go Swizzle! This is going to help immensely when it comes time to texture. Amazing guide. Definitely helps me out. Thanks! Wonderful tutorial! Thanks for taking the time to write this up! I am very thankful for this great tutorial! Can you please tell the setting for the large brushstrokes in Photoshop, I just can't get it right! Great writeup man! I was actually thinking of doing something like this too. I am glad you beat me to it though, because yours it much better than mine would have been. I can't get my brush to be smooth like that! Smoothing is checked on and any other setting is like yours,the brush is standard, square brush! I have one version for horizontal strokes and one for vertical, you can make curvy lines without angle jitter, but will still need one for vertal and one for horizontal. 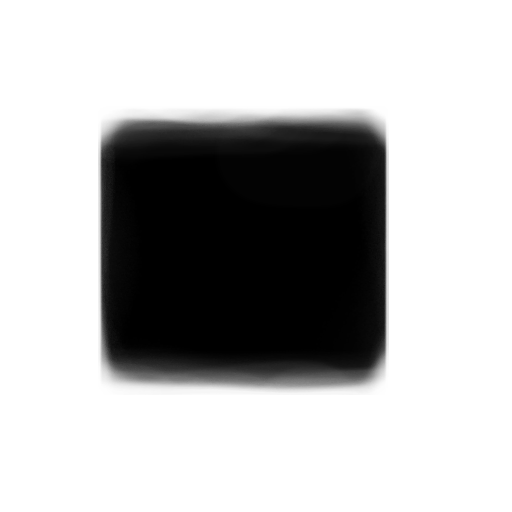 You could make a square stroke with this brush, set that as the brush and have one that goes both ways, but then if you end curved strokes it will have a square end. Definitely! That looks really good. Awesome! 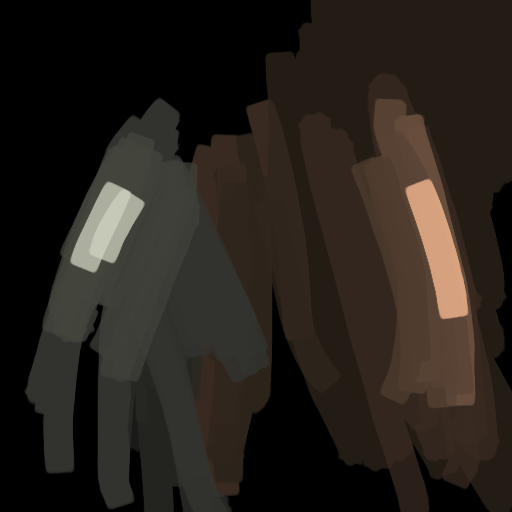 I already had a pretty good idea on the textures and style but this brush and colour swatches are a welcome addition! dang thanks Swizzle. This is some excellent stuff! That was extremely interesting to read and I'm not even in the contest. thanks man that will help alot. Swizzle, you're a rock star in this competition. Thanks for breaking it down. Thanks for the info Swizzle, was a good read. 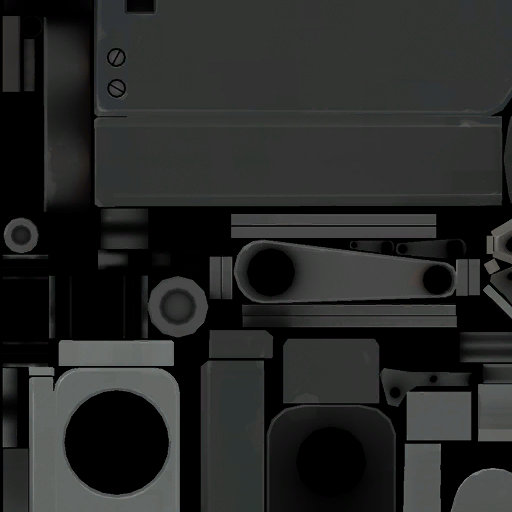 One question though, where do you find the syringe gun specular map? I've looked through the v_syringegun and w_syringegun folders with VTFEdit and all I can find is the team colour variations. The specular maps are stored in the alpha channels of the diffuse maps. 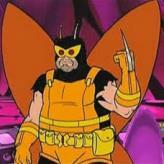 ITT: Swizzle is helpful and pretends he hasn't already won the contest. =P I kid, I kid. Really, nice job on this. Looks to be quite useful. 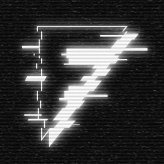 You should get the mods to sticky this thread, as this will help not only the people in the competition but just general 3d modelers as well. awesome article. was about time someone tackels that object ! your reputation grows - me pushes "thanks button"
Wow, this is extremely useful right now, thanks! any insight in the average polycount diffrence for viewmodels and worldviewmodels? Well, Usually you can use the same model LOD0 for both worldmodel and viewmodel, viewmodel doesnt need lower poly LOD model as it is always close to the screen. world model will have up to 5 different LODs in most cases. However the main difference between viewmodel and worldmodel is that the viewmodel will include the arms models. You can all see this kind of informations in the SDK model viewers. There are no reduced polycounts or texture budgets for world models because the world models and view models are the same thing. 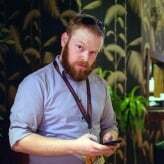 Don't worry about creating a viewmodel and worldmodel; they're going to end up using the same model, so it doesn't make any difference whatsoever. Level of detail for distanced worldviews? It's not really required but it's always nice to have some optimisations. Also the viewmodel and world model arent the same but they do share the same texture. the viewmodel has the arm of the character holding the weapon included in the mesh. They should be, have you seen the buff banner? It's polycount made me weep. Personally, having no LODs shouldn't be a problem, unless as Y_M said you are doing something like the buff banner, from what I remember its 3 sperate models for each part isn't it? Anyway, Thank you Swizzle for the excellent tutorial! I was having trouble getting my textures to match the TF2 style. Quality post. Thanks a bunch! I have a question. When making our textures, should we be appling the ao bake as a multiply layer over the top of our coloured texture? If so so we then have to create a seperate specular map?